HP Photosmart 8753 printer for exquisite photography | Digital Photography. I have had two opportunities to inspect the impressive HP Photosmart 8750 series printer. 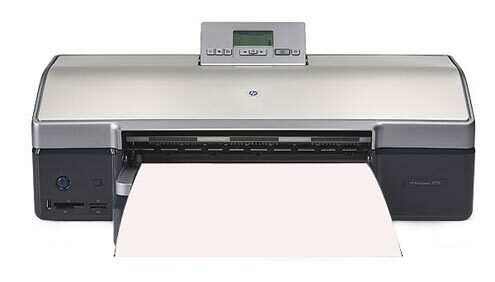 We now have two FLAAR Reports on the HP Photosmart 8750xi, 8750gp, 8758, and 8753. We will show these shortly. 2006 has brought a host of other outstanding 13x19 inch or comparable desktop sized photo printers: HP’s own Photosmart Pro B9180, Canon PIXMA Pro9500. These join Epson’s top quality printers, the R800, which had been out already two years ahead, since Epson previously led the field of printers for photographers and artists. For five years piezo printer manufacturers claimed that piezo printhead technology was advanced and that you should select a printer merely because it had a piezo printhead. Of course this was silly, and now in 2006 the proof is that the most advanced inkjet printers of the new generation are all thermal (bubblejet) printhead technology. HP uses thermal printheads. Now Vivera Ink available in pigmented chemistry, and at larger sizes. The new HP Z2100 and HPZ2200 take the HP Photosmart 8750 forward into the future, and compete favorably with the Canon iPF5000, iPF6000, iPF8000, and iPF9000. Every several years there is either a new Canon iPF printer or a new Epson or a new HP water-based printer. It is hard to keep track of the advances in inks and color management features. FLAAR is keeping track by visiting printshops around the world that have these various brands. Each brand has its good points and a few issues and an occasional deficiency. The advantage of a place that offers both Epson, HP, and Epson is that they can provide some tips on the differences. If a store sells only one brand or the other, they will understandably push the brand they sell. One value-added retailer that we have visited several times is Parrot Digigraphic. They know each of the brands and models. Contact info is 978.670.7766. Most recently updated Sept. 25, 2006. First posted February 26, 2006.